Abstract: Esophageal bronchogenic cysts are extremely rare. 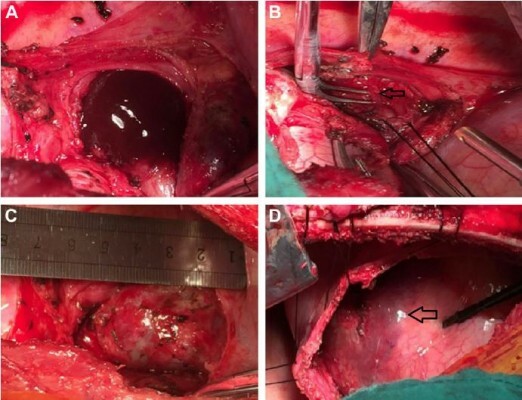 Here we report a case of massive upper digestive tract hematoma and bronchogenic cyst mimicking aortic dissection that was safely removed without esophagectomy. A 30-year-old man was referred to our hospital for the treatment of a mediastinal cystic tumor located in the submucosa of the distal esophagus. His chief complaints were dysphagia > 1 week and severe persistent upper abdominal pain mimicking aortic dissection with constant vomiting for 1 day after gastroscopy examination. The serum level of carbohydrate antigen (CA)199 was > 1,000 U/mL and CA125 was 4,816 U/mL. Hemoglobin levels decreased from 122 g/L to 85 g/L in 5 days. Imaging examinations detected a huge hematoma of the gastric wall. Preoperative diagnosis was difficult. Although the pain indicated a possible aortic dissection, the abnormal levels of tumor biomarkers suggested malignancy. The patient underwent left thoracotomy. The cyst showed an exophytic lesion connected to the esophageal wall at the level of the gastroesophageal junction. Muddy brown contents were obtained by aspiration of the mass intraoperatively. Because enucleation could not be performed, esophageal myotomy in the distal esophagus and partial resection of the cyst were selected. Histopathological examination indicated a bronchogenic cyst of the esophagus. At a follow-up visit 3 months later, the patient had no signs of disease recurrence or any complaints. Postoperative tumor biomarkers returned to normal range. The present report summarizes the clinical details of the case and reviews the literature in order to improve the accuracy of diagnosis.